Sung Hyun Park of Republic of South Korea won her sixth LPGA Tour victory at the 2019 HSBC Women’s World Championship after shooting a final-round 8-under-par 64 on the New Tanjong Course at Sentosa Golf Club, sealing the win by two shots with a 15-under total. Park birdied her first three holes and made two additional birdies on the front with a bogey on No. 8, then returned with four more birdies on the back, outplaying runner-up Minjee Lee (-13) and third-place finishers Jin Young Ko and Azahara Munoz (-11). “I didn't think I would win this fast and I'm really happy. I am used to having a tough start to the season these past few years, and this first win came so fast, I think I will play really comfortably the rest of my season,” said Park just after the final putt dropped and she was declared the winner. Sung Hyun Park is known by many nicknames including Namdalla (“I’m different”), Dak Gong (“Shut up and attack”), one of them being “Tiger” for her prowess on the golf course and named after her golf hero, Tiger Woods. The 25-year-old South Korean golf sensation was surprised in early February on set at a TaylorMade brand shoot when she had the chance to meet Woods. Park started the final round four strokes behind leader Ariya Jutanugarn and made a charge for the top, shooting the week’s low round of 8-under-par on Sunday while Jutanugarn finished T8 after a disappointing 3-over-par final round. One errant drive effectively ended Minjee Lee's title bid at the HSBC Women’s World Championship on Sunday after she had been tied for the lead with Sung Hyun Park at 14-under with just five holes to play. The par-four 14th had been set up as a driveable 282-yard hole for the final round and Lee, after initially thinking she had hit it well, watched as her ball ended up in the tongue of a fairway bunker from where she hit two poor chip shots en route to a bogey five. "I thought I hit a good drive on 14, I just over-drew it a little bit and the wind was left-to-right," Lee said after finishing runner-up for a second consecutive week on the LPGA Tour. "It just ended up catching the bunker and went into the tongue in the rough. I thought I hit a pretty good chip shot but probably just a little bit short because if you go over, it's going to be down the swale. I was just thinking about that, but I feel like I didn't hit such a bad chip shot. Just came out a little bit short and then I decided to chip it again, which I didn't really hit a good chip shot. So that hole was pretty much the killer." 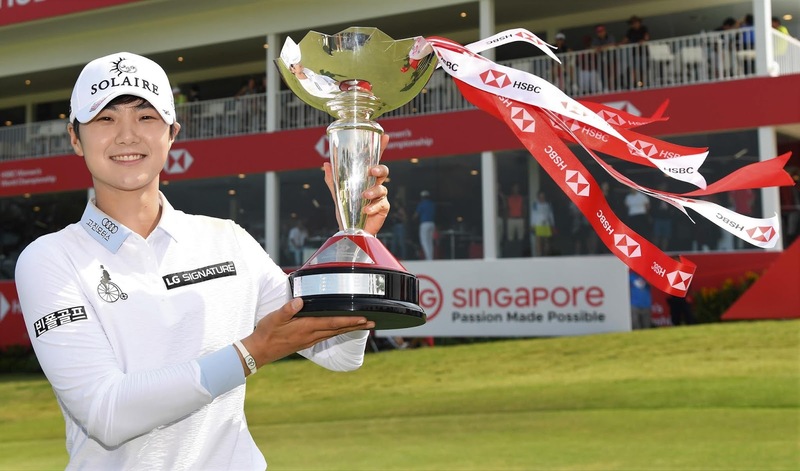 Overall, though, Rolex Rankings No.3 Lee has every reason to be in good spirits after playing excellent golf over the past fortnight, initially at the Honda LPGA Thailand and then this week in Singapore. "I've been playing well and today I turned at 3-under, probably missed a couple opportunities at the beginning of the front nine," she said after closing with a three-under 69. "I just didn't give myself too many opportunities for birdie, and made a bad mistake on that one drive. But I feel like I've had a really good two weeks, and hopefully it just sets me up for the year." Eun-Hee Ji had the best seat in the house on Sunday to watch Sung Hyun Park's stunning run to her sixth LPGA Tour victory since she was grouped with her fellow South Korean in the final round of the HSBC Women’s World Championship. While Ji carded a two-under 70 to finish alone in seventh place, Park played brilliant golf to sign off with an eight-under 64, the best score of the week by two shots. "This is the best round she has ever played with me in competition," said Ji, a five-time winner on the LPGA Tour. "She hit it really well today. She hit her shots pretty close to the pin, and she made everything pretty much on the greens. I feel badly for Minjee (who placed second). But Sung Hyun was playing really good, so that happens all the time." Ji, who won the season-opening Diamond Resorts Tournament of Champions in Orlando, was happy enough with her own week in Singapore. "The course is really nice out here, and I just keep trying to make fairway and greens as possible," she said. "The greens firm here, so it was really hard to hold them and I always have to think about how much roll I have. That's all, I'm just trying hard."